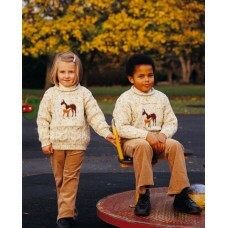 Premium quality knitted woollen sweater with fleck yarn and roll neck and featuring a horse and foal motif embroidered on the chest. A hardwearing garment that is soft on the skin, warm to wear and extremely comfortable. This Irish sweater combines traditional decorative stitch design with modern machine embroidery to create an adorable childrens sweater that is suitable for both smart and casual wear.